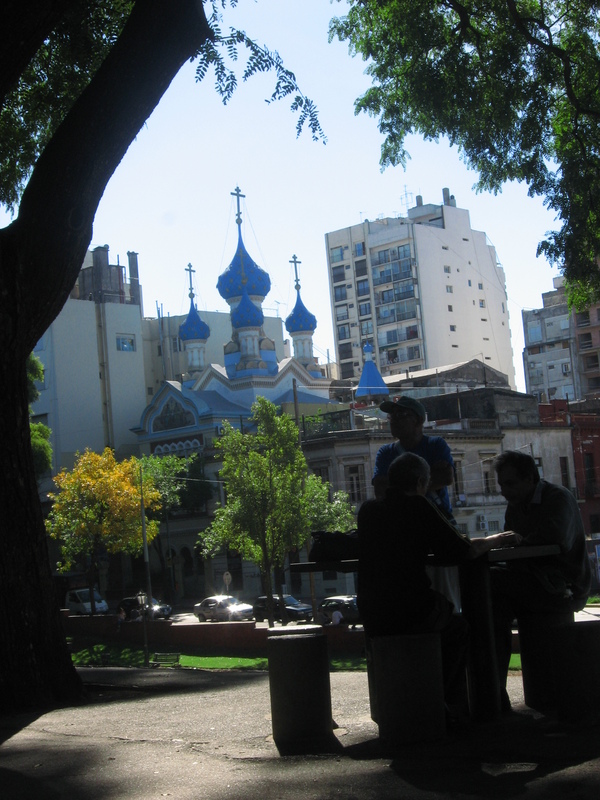 I just got back from a fantastic Easter weekend in Buenos Aires. I left the city at midnight last night for an overnight trip back to Cordoba, and at 3am the city had a major flood. I am feeling quite thankful for having avoided that, and sad that the people of BsAs have to deal with the damage. My travel companion was a fellow volunteer named Alicia. We left for BsAs Friday morning at 9am for the ten-hour trip. When we arrived, the first neighbourhood that we saw was full of shacks, houses without doors, and piled one on top of the other. We noticed grafity everywhere on our cab journey to our hostel, and then our first impression of our accommodations was that it ressembled a frat house; beer pong tournament going on, people never sleeping, and drinking all the time. Not wanting to go out in a city where we did not know anybody, and did not know our way around, we avoided the hostel for the first evening. We lucked out and found a really great restaurant called Rosalia. 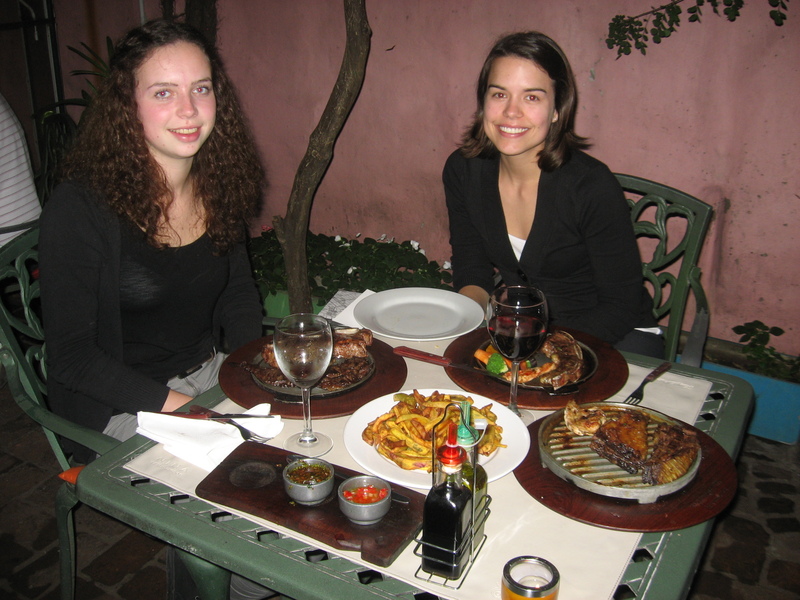 We ordered a traditional Argentinean meal, complete with two different cuts of beef, chicken, and I think lamb. 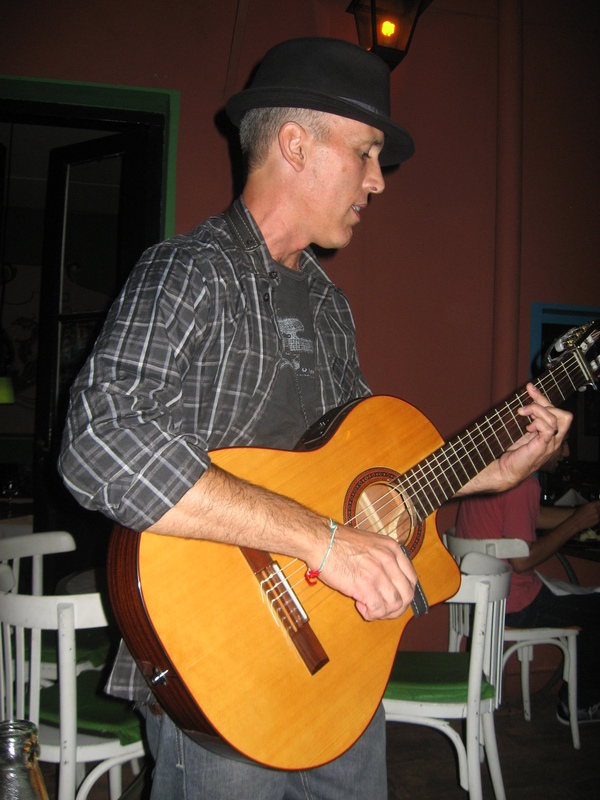 I had a couple glasses of red wine, and then we were serenaded by a guitar player, who played traditional tango music. He was very friendly, and even though he did not speak much English, we were able to have a bit of a conversation in Spanish. He recommended tango musician Carlos Gardel to me. Anyway, he was a very talented musician, and played a show at the restaurant until 2am! Alicia and I also got invited to have a drink with a bunch of other men who were sitting at the table beside us. Turns our they were in their 40s and had kids, and were out celebrating that one of them was getting married the following weekend. Again, despite them not speaking English, we still managed to have a conversation with hand gestures, and my muddled up Spanglish French. The following day, Alicia and I covered a lot of ground, and by foot. 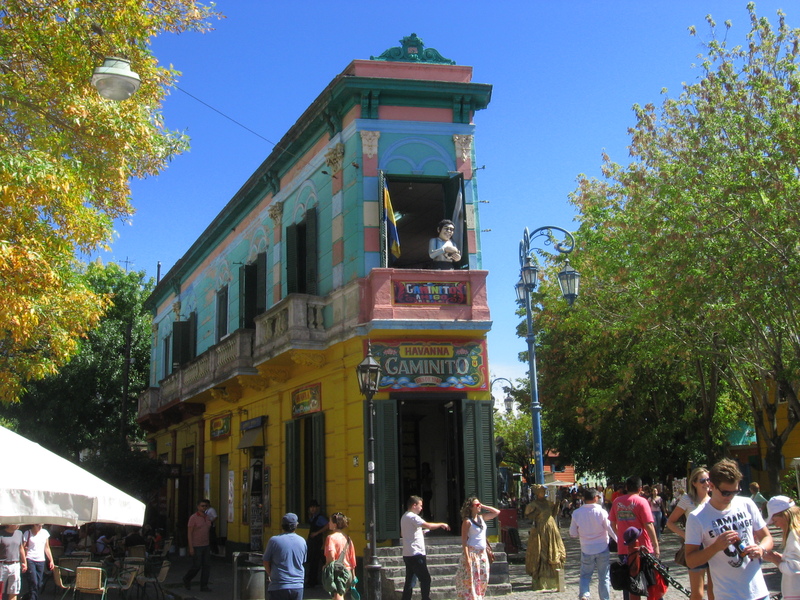 We walked to an area called La Boca, which has multi-coloured buildings everywhere, vendors, restaurants, and tango dancers. We strolled around watching tango dancers dance spontaneously in the street, listened to the music being played by live musicians, and observed the beautiful art being sold along the street. We even saw someone painting with his mouth, and he was so good at it! On our way to our next destination, we took a break in a lovely park, where we watched people play chess on the outdoor chess tables. 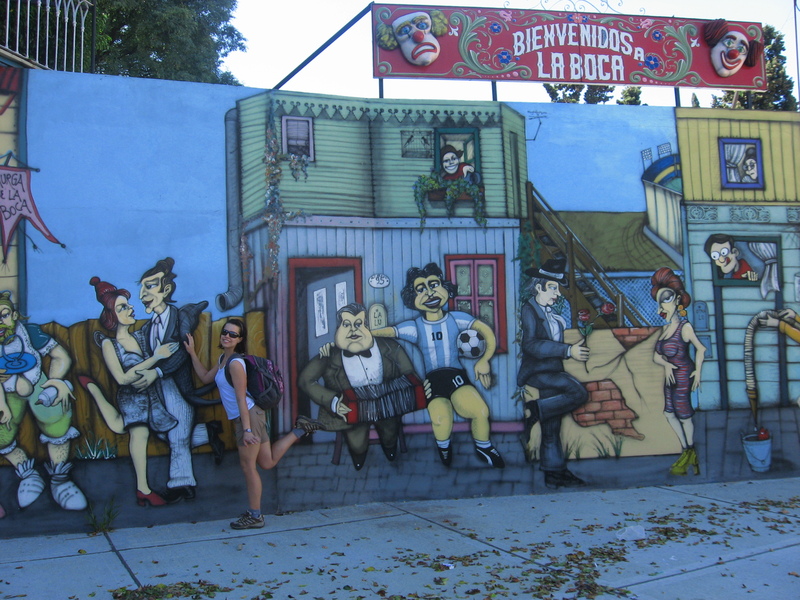 The thing that I loved about BsAs was that no matter where you are, there is something cool to look at. This was our view (an Orthodox church in the background). 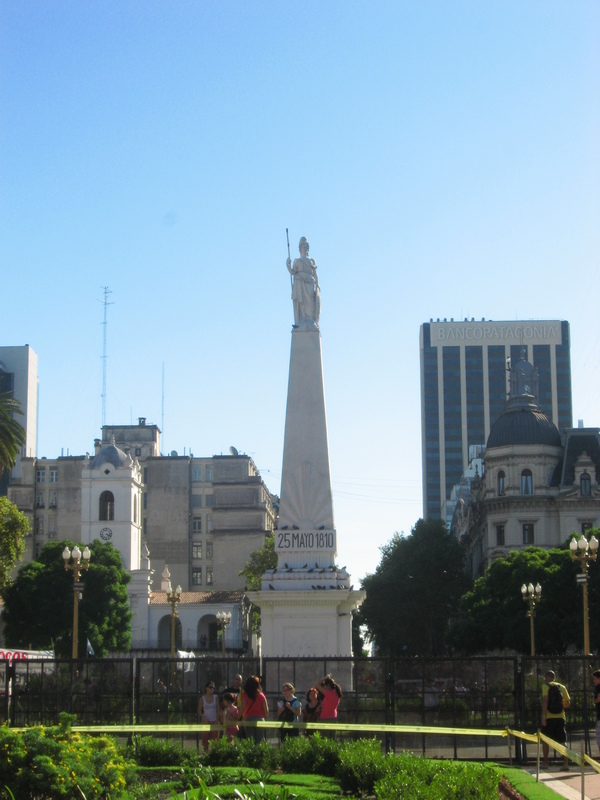 We then ventured to Plaza de Mayo, a square in the heart of BsAs. We engaged in conversation with a local, who told us that to see all of BsAs we would need an entire year. We told him we would have to settle with just three days. 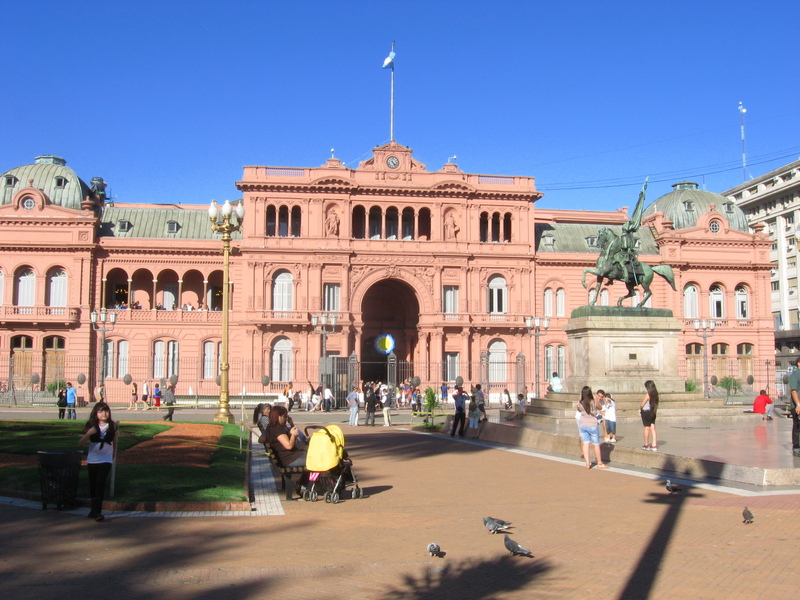 Below is Casa Rosada, which the presidential palace, and is at one end of the square, and then Piramide de Mayo. Alicia really wanted to have an icecream, and we found a delicious gelato place, where we both had dulche de leche flavoured gelato, accompanied by a scoop of chocolate gelato. mmmmmmm. I thought the shape was funny-looking. The shopping in BsAs is amazing. One of the malls had beautiful art on the ceiling, ressembling what you would see on the ceiling of a church. After this full day of walking, we returned to our hostel for a siesta, and later went out for dinner, and had homemade pasta. The waiter messed up three different times, but he was really charming, so we let it slide. By our second night in the hostel, we grew to really like it. We met a lot of really great people, and ended up playing Jenga with people on the terrace, and later having a beer with some others. It reminded me a lot of residence in university. 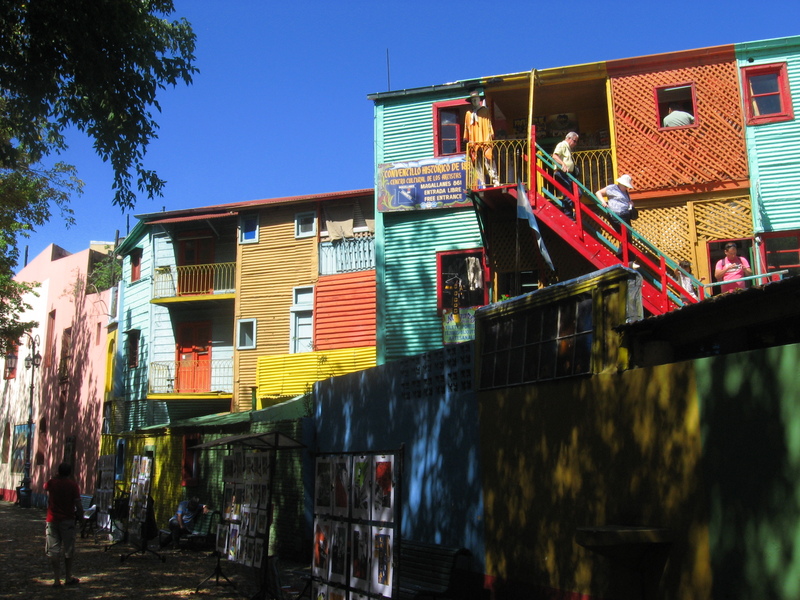 It was interested to learn about the person and how they ended up at this hostel in BsAs. It´s too bad that I´ll never know about the rest of their journey; for example, our roommmate Jessie, who was only 18, had just arrived from England, and was traveling alone for four months. The next day, we went to the Sunday market in San Telmo, which spans about 20 blocks, and was the coolest market I have ever seen. We bought some freshly squeezed orange juice (watched the guy juice the oranges on the spot) and strolled down the street for about two hours, looking at everything, and listening to the live music. I bought some souvenires there too, including a mate mug (people drink mate here like Canadians drink coffee!). 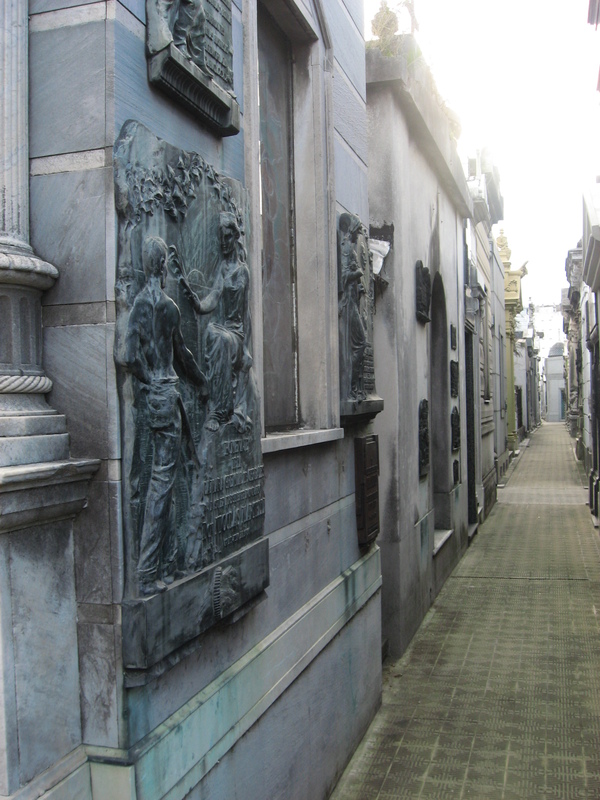 In the afternoon we visited Recoleta, an area of town that has a huge cemetary. The tombs are as big as small houses, and were owned by rich families in Argentina. 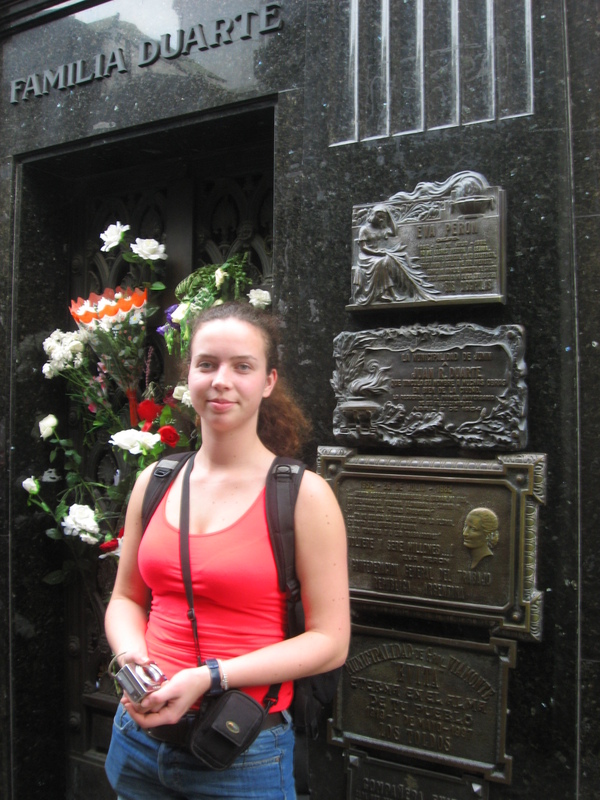 We even found Eva Perón´s tomb. It was a little creepy being able to see some of the caskets through the windows, but we got used to if after a while. That evening we ventured to another end of town called Palermo, and ate dinner there. Then, we returned to the hostel exhausted after another full day of walking. The subway in BsAs is great, and only costs 50 cents Canadian per ride. I enjoyed the musicians that enter the subway cars and play; I saw a trio comprised of a clarinet, trumpet, and ukelele, and a piano-percussion duet. There are many buskers in this city who are very talented, and make walking through the streets very enjoyable. There is also beautiful grafity on almost all of the surfaces in the city, making all the walls look interesting. 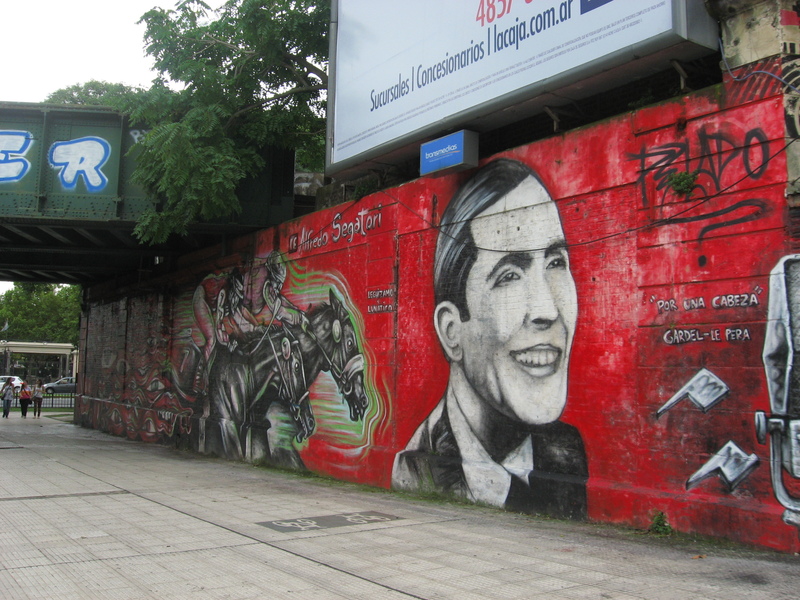 Here is a picture of Carlos Gardel. Unfortunately, there is a lot of poverty in BsAs. Also on the subway are many beggers, and people trying to sell you things (one woman was selling kleenex, and another man was selling pens). It was especially sad to see a little girl trying to do a high-five routine with passangers, and wanting money in return. The city also has a garbage problem – there was garbage and dog poop everywhere, and many garbage bins overflowing with waste. It was things like this that made the city seem a bit dangerous. Alicia had three different people try and get into her bag while we were walking around, with no success. 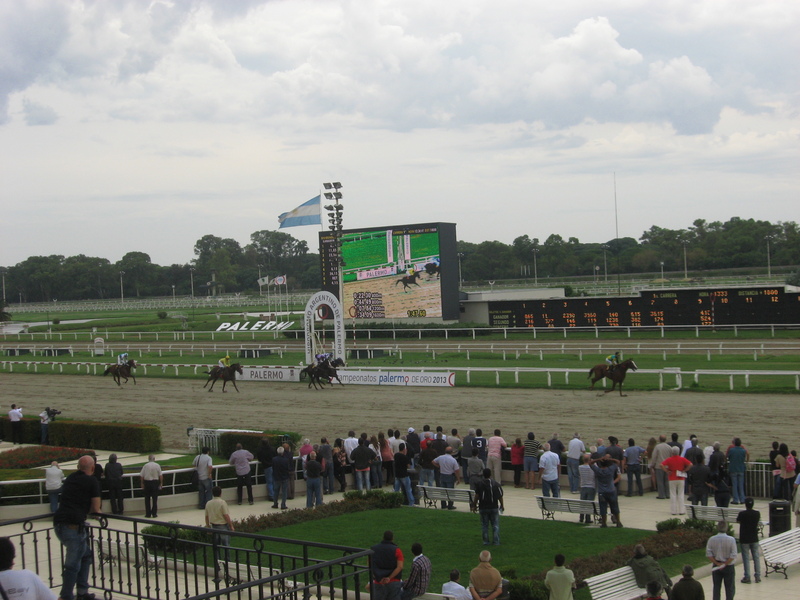 On our last day in BsAs we went to the Hypodromo, where the horse races happen, and I got to see my first horse race! We also walked through the botanical gardens. After three jam-packed days in the capital of Argentina, we took the midnight bus home to Cordoba. The buses are quite comfortable, so I managed to get about 7 hours of sleep! Overall, it was a lovely weekened, and again, I am so thankful I left before the flood started. It’s so interesting to read about your adventures and the personal thoughts and observations you include. If feel like I’m there.